When, in April 2014, an American team of six teenage daughters and their mothers saw for themselves how huge numbers of Kenyan girls are forced to miss school owing to lack of sanitary protection, they decided to take action. And they certainly did! Under the leadership of Lauri Harris, the team has raised $1,000 for FFG, which will keep 200 girls in Migori in school for a whole year, without needing to miss up to 5 days a month. 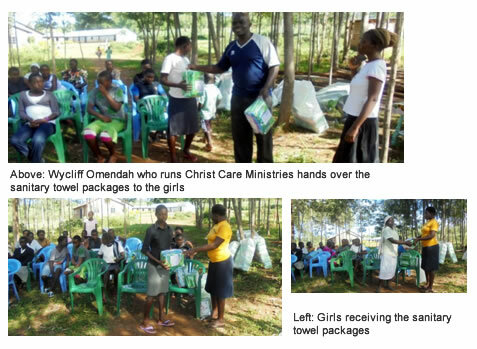 Under the umbrella of Christ Care Ministries (a CBO supported initiative which runs an orphanage and a school), these girls were also given health lessons and sanitary equipment. THANK YOU to the Mother/Daughter team that worked so hard to keep our girls in school!